In the previous article I explained how to monitor your data and how to detect changes using tools like Integrit, which is a Host-based Intrusion Detection System (HIDS). Discovering the changes in files is already quite nice, but keeping track of the content and its changes over time is much better. In this article, we will have a look at different ways to use a revision control system by doing commits automatically. The solutions we looked at up to now will help you to answer the question, "Did my data change?" - although you do not know what has changed exactly. The original data has already been overwritten, and in retrospect only you will notice the changes. There are two ways to identify the differences - comparing the current data with your external backup, or use a revision control system like Git or Apache Subversion (SVN). Both tools offer you a version history for the files and directories. The disadvantage of these solutions is that they require an additional step - a commit as soon as an entry in the filesystem has changed. Both Git and Subversion do not do that automatically. $ git commit -a -m "current changes"
Combining Git/SVN commands with find, xargs, incron, fswatch, or inotify helps, and allows you to process such events without manual intervention. Inotify works by watching for changes to the filesystem and notifying applications of those changes. The following code shows a call based on the inotify kernel subsystem using inotifywait. 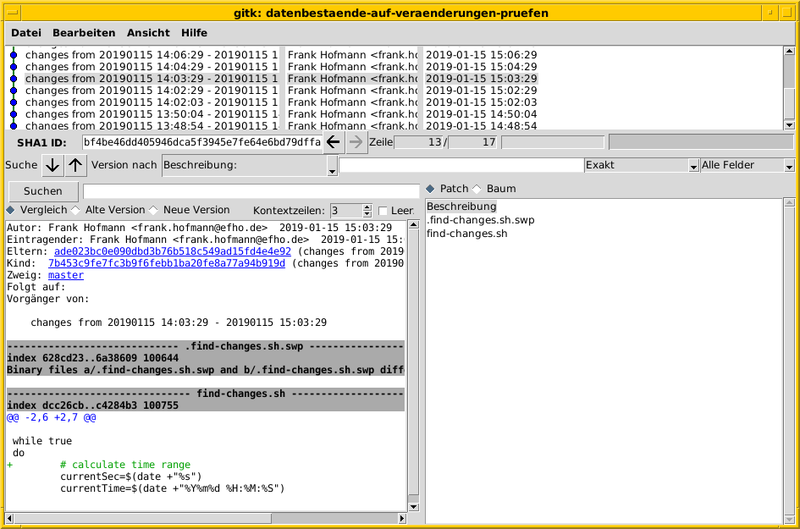 A Git commit happens as soon as the changes in the file file.txt are written to disk. In order to track entire directories you should use the additional switch -r.
The following bash script uses tools that exist on every Linux system, and combines find, xargs, and git. Once per hour the script checks for files having changed within the last hour, and commits them in a local Git repository. echo "--- $previousTime - $currentTime ---"
git commit -v -m "changes from $previousTime - $currentTime"
In order for one to see what has changed between the single commits, they may use gitk - a graphical repository browser - to display that. In the same category of tools you'll find gitwatch and Flashbake. Basically, gitwatch is an extended version of the bash script from above, and also uses the inotify kernel subsystem. Nonetheless, gitwatch has not been packaged for Debian or Ubuntu yet. However, the second project - Flashbake - has been in existence for a much longer time, and connects Git and Cron. Written in Python, it is available from the project website as well as a regular Debian package. In order to track file modifications, Flashbake requires a Git repository as well as a file named .flashbake in it. The latter one is meant to contain the list of files to be tracked. This entry calls Flashbake every 15 minutes, and tracks the content of the directory /home/frank/data (although you'll want to change this path to suit your needs). The error messages sent to stdout are simply redirected to the digital trash called /dev/null. In order to see the changes between the commits you may either use gitk (see above), or use the command git diff. With the help of these tools you can figure out if, when, and especially what kind of data has changed on your system. By using Git you can resort to previous versions. It is recommended to keep space for additional data - the backup has to be stored somewhere, and on an external device, ideally. In the context of security, in order to prevent unwanted changes it is required to work with further safety measures, for example on the level of the access rights, and the system services.